Regularly chat and network with other corporate leaders regarding disability issues without ever leaving your desk? Ask your most pressing disability related questions and get answers from today’s leading experts? Learn about the latest legislation, key issues and best practices relative to mainstreaming disability in the workforce, workplace and marketplace? Experience this on a monthly basis and at no charge? 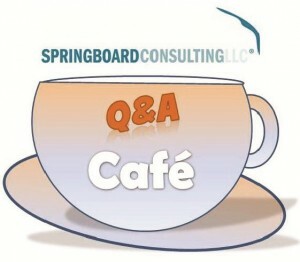 Springboard’s newly established Q & A Café is for you. There’s no cost, no obligation, no commitment; only the opportunity to participate as you wish. If interested in participating in Springboard’s Q & A Café please email us to opt-in to our communications at info@consultspringboard.com, Subject: Q&A Café, please also include your company name and telephone number. We will only use this information only to alert you to Café dates, times and dial-in information and communicate with you about your most pressing topics.